Often children with parents who have achieved great stardom and fame, struggle to establish themselves. Sometimes the effects of being overlooked and overshadowed by their esteemed parents careers is a reality that cannot be escaped. 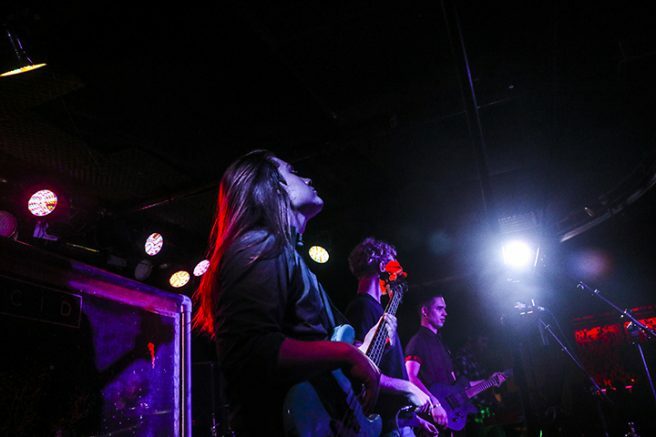 ARC student Tristan McNay has managed to forge his own musical path as the son of bassist Dan McNay – former member of Montrose and the Frank Hannon band as well as playing with the band Tesla – who sold 14 million albums in the United States. In a recent interview, Tristan spoke humbly about his roots and had no unkind words to say about his father’s preeminent career. There is an entirely separate story to tell that involves McNay’s own accomplishments and goals. As a student at ARC McNay has deviated from following in his dad’s footsteps. He has made his own educational plan to advance his dreams with music. Unlike his father McNay said he didn’t pick up and start playing bass seriously until his sophomore year of high school. This sort of thinking aligns with McNay’s opinion on how kids respond to being taught how to play instruments. “Look you have a kid that’s playing air guitar they’re gonna do it with a smile on their face… but if you give them their first lesson on an actual guitar that smile’s gonna go away,” he said. He said he attempted to play guitar but knew right off the bat it wasn’t for him. Once he began messing around with bass, however, that’s when McNay said he knew it would be forever his instrument of choice. High school was McNay’s time of ‘80s hair bands and metal made to make your ears bleed. Bands like Led Zeppelin and Iron Maiden were at the top of his playlists. The phases and stages he went through are key to what he says has made him into the musician he is today. One notable phase was the one in which he taught himself “The White Album” by The Beatles, front to back. Considering it took him a full year to learn, he still said that he loves it and that it remains one of his favorites. The dedication doesn’t stop there either. McNay says he continues to challenge himself, both musically and academically. His days are comprised of band practices, divided between his two bands Lucid and Our People and a full class load. “I have 18 units but there’s more though because I’m playing in performance classes, I just didn’t enroll in them… I didn’t want to deal with the dean… get them signed off,” Tristan said. Bandmate Matt Lomas says McNay networks with a lot of musicians and welcomes collaboration. “He always loves playing with new people to expand his talent,” Lomas says. At one point McNay says his desire was to be the best but through his own logic and reasoning, he came to the realization that it’s not about being “GOAT” –i. E. the “greatest of all time” -but rather loving what he does. This is a far cry from following in his dad’s footsteps. Rather he is creating a path of own, using bricks of knowledge and experience to pave the way. Cheyenne Drury is a third-semester student on the American River Current, where she serves as the Editor-in-chief. She previously served as arts and culture editor and news editor. She is double majoring in journalism and photojournalism. She has competed in softball, cross country and track all at the college level. She was published in the American River Review, the award winning college literary magazine. 1 Comment on "Son of a famous parent establishes himself as musician"